(2013-10-22) Searching For Certificates Matching A Specific DNS Name Or WildCard Name « Jorge's Quest For Knowledge! 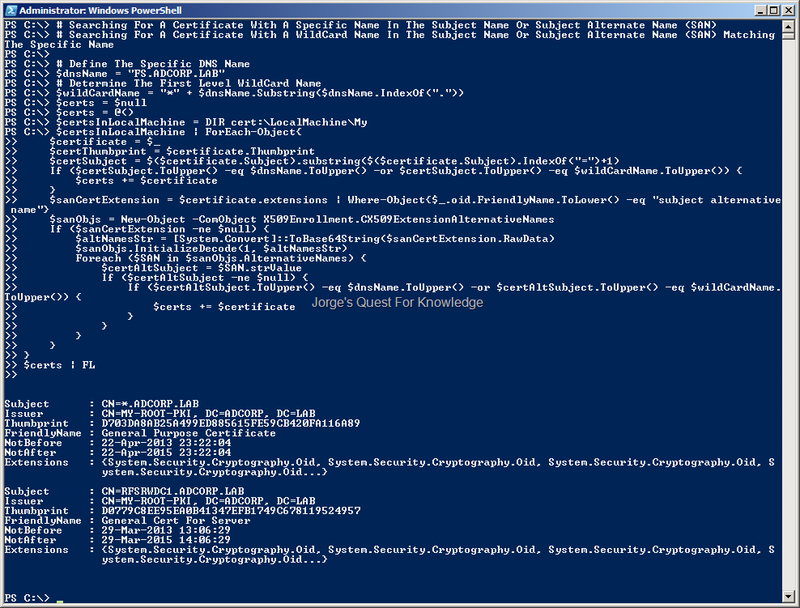 This entry was posted on 2013-10-22 at 19:29	and is filed under Certificates, PowerShell, Tooling/Scripting. You can follow any responses to this entry through the RSS 2.0 feed. You can leave a response, or trackback from your own site. How about getting the script to work across the network, e.g. scan multiple servers and report back on the SAN in the certificate? Scenario would be domain controllers that you want to check the SAN field on. Maybe even compare a predefined SAN field to teh actual and report on differences.